Quilting Makes/Breaks the Quilt | OccasionalPiece--Quilt! Posted on April 3, 2014 by Elizabeth E.
As you know, I recently finished quilting the Lollypop Quilt that I’d been working on for about two hundred years or so, and so appreciated all your comments about taking time to sit back and live with the quilting before I made any rash decisions to become a Quilt Surgeon and slice and dice up the quilting I didn’t like. Showing you pictures of my quilting close up is like agreeing to pose, at my age, in a bathing suit. Probably not a good idea, but I wanted to show you how even rank amateurs like myself can be pretty happy with how things out. I am even learning to like the quilting spots that I thought were a total fail. Radiant mushrooms with echo quilting. A feathery sort of stitch. Every day when I’d start quilting, I type in “background FMQ filler” and read on the internet for a while, gleaning from the Master Quilters. A sort of swirl-this-way-then-that sort of stitch. Of course those long-armers make it look easy with their stitch regulators and space and ability to clamp down the quilt so it doesn’t move. And I love learning from them and admire so much of what they do. Which brings me to the title of this post. One longarmer I dote on, learn from, admire immensely, and generally adore is Judi Madsen of Green Fairy Quilts. She is a master–all her stitches are perfect and even, and she has fabulous designs, and a terrific book. So I was more than excited when I noticed on her IG feed that she was quilting a Kim McClean pattern quilt, Kim being the woman who designed my Lollypop Tree quilt pattern. Zounds! I’ll learn from the best, I thought, because she is the best. 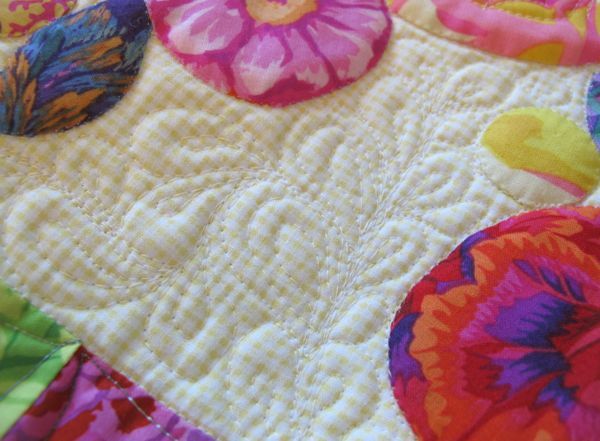 This picture is a snapshot from her blog post about the quilt, and I only insert it here to give you an idea of her style of quilting. Really, I can’t say enough nice things about what she does. My reaction came more slowly. A sort of creeping feeling that maybe I’m just not in the Great Big Quilter’s Loop or something, but I didn’t (can I say this?) like the quilting on this quilt. It was stunning. It was stellar. It was perfection. 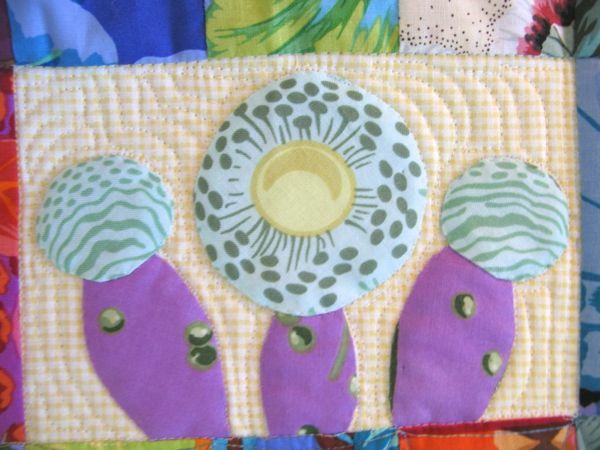 But I remember when making my quilt, spending hours on each block, choosing all the florals, working with the sinewy forms and floral blooms that I was thinking about nature and form and randomness. And I guess I was hoping that Judi would find a way to make those shapes and forms burst right off the top into a new space. 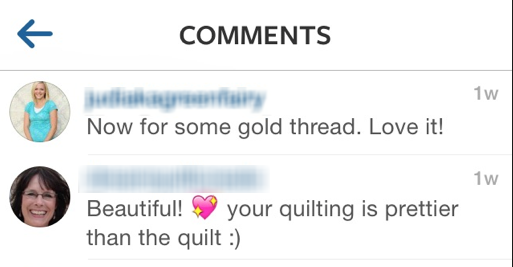 Couple that feeling with a comment left on Instagram (above): “Your quilting is prettier than the quilt.” Hmmm. Has the maker been eclipsed by the quilter? Certainly quilting has become its own art form, in a way, but if the quilting is what matters, why not just send a pre-printed panel over to these long-armers and let them go to town? Does it matter what we, as piecers and top-makers, do? Is it necessary for our art and design to be subsumed into theirs? I’m shaking my head, still trying to figure it out. To be honest Elizabeth, I have not followed that blog for a long time because I decided the quilting was often too overpowering. The quilting needs to ‘work with’ the piecing, not compete with it. So hang, draw and quarter me, your pretty work will always beat the perfection. precision and intricacies of the aforementioned quilter! My first impression, as I was reading and scrolling down, and came to the photo of the Kim McClean quilt, was “Oh, no!” It’s beautiful quilting, but it doesn’t belong with that quilt. I’m thinking strait-jackets, stiff boned corsets, and such. I really like the way you’ve quilted yours. I think your quilting is lovely, especially the middle one you called feathery. I am working on learning FMQ and I never know what to choose. I feel like you chose well in the examples you showed from your quilt. Elizabeth, there is absolutely nothing not to like about your quilt! I think that the quilting fits the quilt, and you should be so proud! Celebrate your finish!!! I guess it’s all in what you want to see in a quilt…..I’m for the color! All I could think of as I read your post was the contrast between concert pianist and accompanist–and they can be the same person. A time and a place for each. 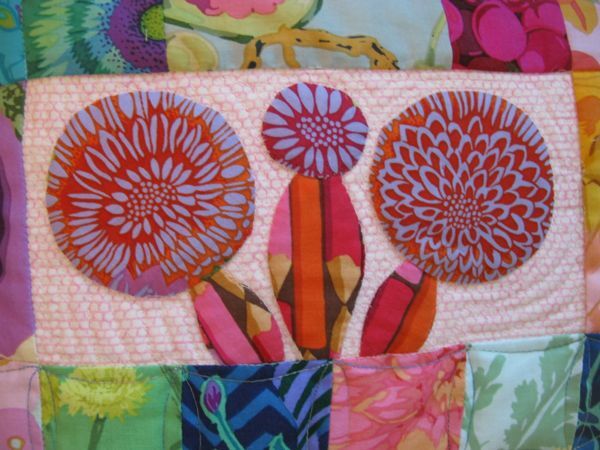 When I re-entered quilting in 2009 and spent a lot of time in my local quilt shops, it became abundantly clear to me that quilts were like babies – each a beauty in the eye of the mama. I like the color part of quilt making and always see that first, never the quilting design. In the case of Judi’s quilt, the design is so bold, I had a hard time noticing the fabric. And with the time she surely spent on that quilt, that alone would disappoint me. Again, each a beauty in the eye of the maker. Love, love yours, Elizabeth. I try to avoid quilting blogs because it’s too much to compare professional long armers to what I can do on my home machine- I think you’ve blogged about that before? 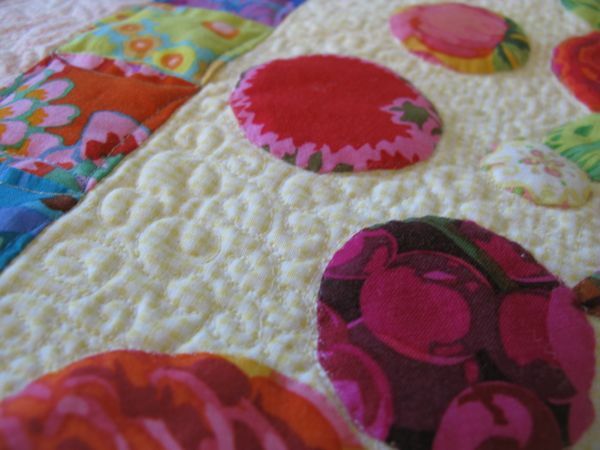 Anyway I do love Judi’s quilting but there absolutely needs to be a balance between the quilting and the piecing. You raise really interesting points about “over quilted” work. I seem to see a lot of it out there. The quilting is lovely, but I agree with others that it doesn’t seem to go with this quilt. I suppose that is a danger when 2 different people with 2 different style ideas work on one piece. I think your quilting is beautiful and more – it’s yours! What a thoughtfully written piece. There is a fine line between enhancing and overpowering. Also, to reply to your point about those commenters who dumped shame on the poor quilter – I think we as readers also walk a fine line. We have the freedom to read or not read a blog. Do we also then have the freedom to comment positively or negatively? I struggle with this if I don’t agree with the blogger (on big or small things) because I realize I can just click off and not read it if I don’t agree. Then am I being dishonest because I would readily comment if I agreed? Am I giving the blogger a false sense of “good job”? Thanks for the thought provoking entry. Happy Friday to you! The quilting is beautifully done but not for this quilt. 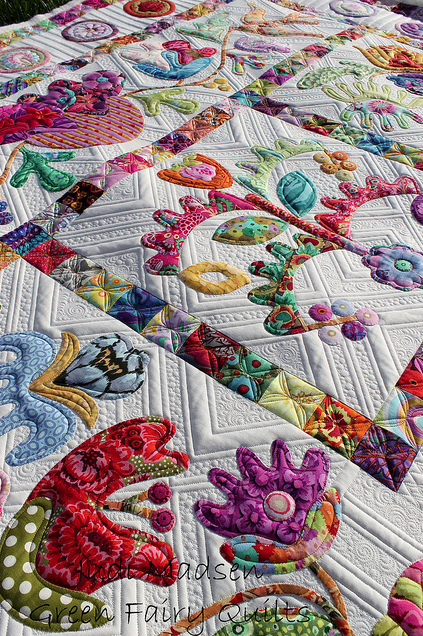 To me the lovely colourful curvy appliqué is overpowered by the straight lines of the quilting and it is the quilting that seems to dominate. Not the right way round to my mind. I have lots of thoughts and have written and deleted about 10 comments! The gist: You are an amazing artist. It is perfectly ok to have opinions about other artists and it doesn’t devalue their work at all. We don’t all have to love everything. I’m certain that you will find the parts of this very quilt you love and integrate them into your future work to create something special and uniquely you. Another thought provoking post Elizabeth. Some very interesting points raised that I hadn’t thought about. There seems to be a trend towards quilting that is quite dense these days. I think you’re right that the quilting is taking center stage over the actual quilt. Another evolution in the industry that will no doubt shift again. I’m much more interested in the design and play of fabrics. With a quilts full of prints like Kaffe or Amy Butler like I often use the quilting is hardly noticeable anyway. If I had the skill and/or desire to do more detailed quilting perhaps I would. And I can’t afford to have a long arm quilter do all that custom quilting although I’d love to have just one quilt that was super quilted. I’m just going to be satisfied with what I can do and what I can afford. As for your quilt, I’m quite impressed that you did the quilting and think it suits the quilt perfectly. I agree that the other quilt has fabulous quilting but I don’t know that it works all that well with the quilt itself. i honestly do like yours better. Sometimes feel that practically everything in quilting blogland and even in the industry is one gigantic popularity contest. Never been into that myself. P.S. Your pics didn’t any need to pick out, as far as I could tell. Perhaps you’re being a bit hard on yourself. Ooops! Your pictures didn’t indicate any need to pick out the quilting, as far as I could tell. I read this post when you first published it, Elizabeth. I had an immediate response but wanted time to think about it a little more. Aside from color, fabric, pattern, etc., it seems to me there are two parts to a quilt: the patchwork/applique/wholecloth quilt top and the quilting that holds the top and back together. One can be great and the other not, but somehow they have to work together to create a unified whole. For me, if one stands out above the other, it better be the quilt top and not the quilting. Is the snapshot from the other blogger’s blog YOUR quilt? If so, I’m so very sorry. The quilting is gorgeous but maybe it would be better on a wholecloth quilt than on an applique quilt. It deserves it’s own showcase, just as the applique top does. I’m really opinionated about this topic but I’ll stop now. Thanks for opening the discussion.